We very quickly came to enjoy our time in Thailand. Even though the Chiang Mai Metropolitan area has a population of close 1 million people it has a slower more appealing pace than what we initially thought we would experience. The people are so polite and respectful and always have a smile on, you can’t help but be happy. Here we are at our art class. Things are so inexpensive we were able to enjoy many classes that we might not have done if the price was higher. Whenever you approach a place (business, market, etc) the people are always smiling and so happy to have you there. The prices are great so you want to stay. We had the kids teeth cleaned – it was too booked for Steve and I. 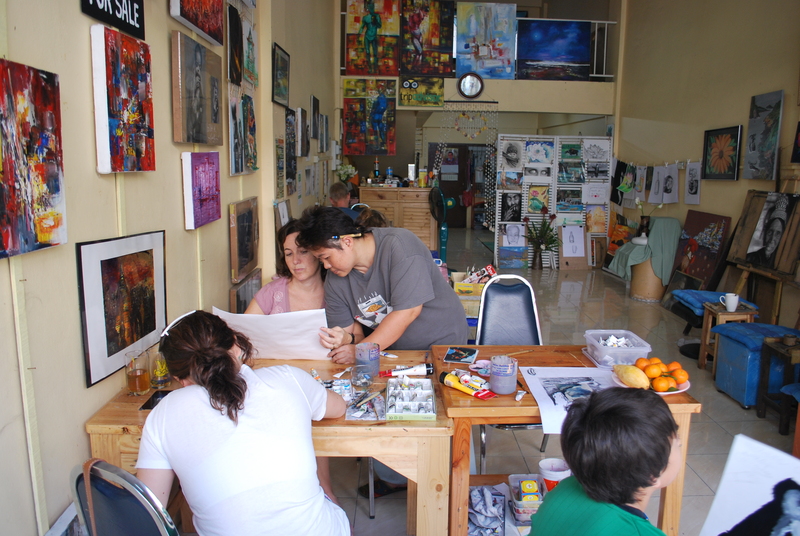 We also took a painting class from a wonderful artist in town. It was so much fun – we went 2 different days for an hour and a half. I don’t really see a future for any of us but it was a great, relaxing way to spend some time. We also had our share of massages. 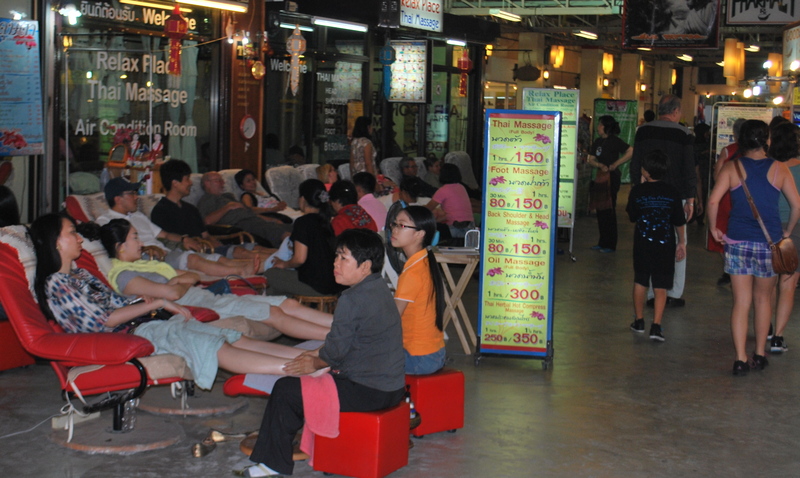 Massage is a huge part of Thai culture, everywhere you go people are getting massages. We took advantage of this on our first day in town and throughout our time there. Such an amazing luxury for such a great price, we couldn’t resist. Just one of the MANY massage establishments. 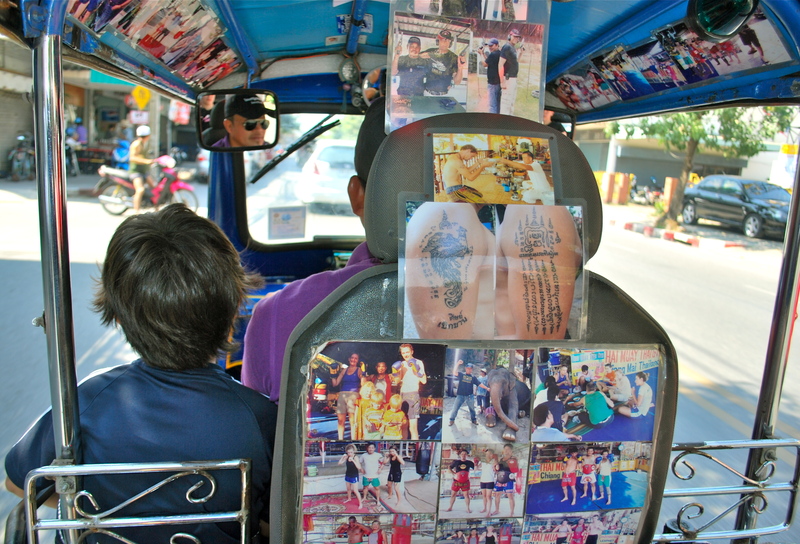 One of the drivers asked Keegan if he wanted to ride up front with him - so here's what it's like to ride shotgun in a tuk-tuk! A Sonthaew - just hop in the back! Steve negotiating our best rate! Could Keegan start a TUK TUK business in Naples??? I visited Chiang Mai when I visited Thailand for a month in 1973. It was a sleepy place then. Less so now! 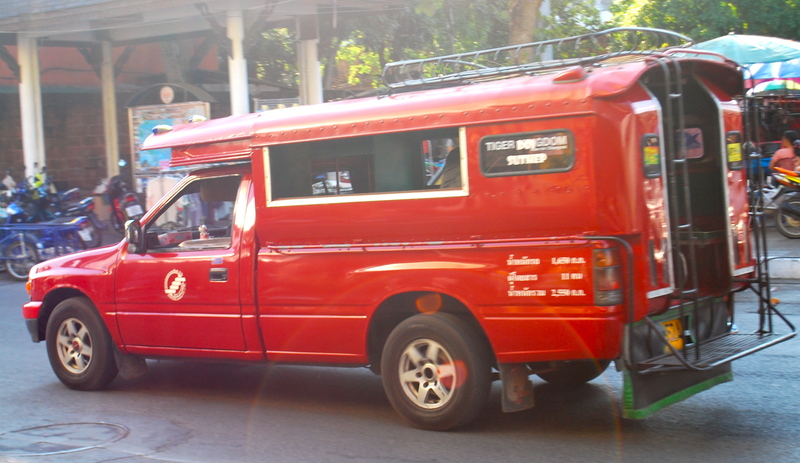 We called the Sonthaew vehicles Baht Buses and a Baht was work 5 cents. I felt guilty negotiating some one down 15 cents when they were trying to feed a family. Fortunately, we were told to say, “No, no – I’m G.I.” which told the folks you knew to bargain and they’d typically cut the price in half immediately. Thanks for bringing back that memory! Hope you folks are enjoying making memories of your own! Did you get any Thai silk? Beautiful fabric and like the massages, very inexpensive! How about the Thai food? Are you enjoying it? Beautiful presentation of the food on the plates and delicious! 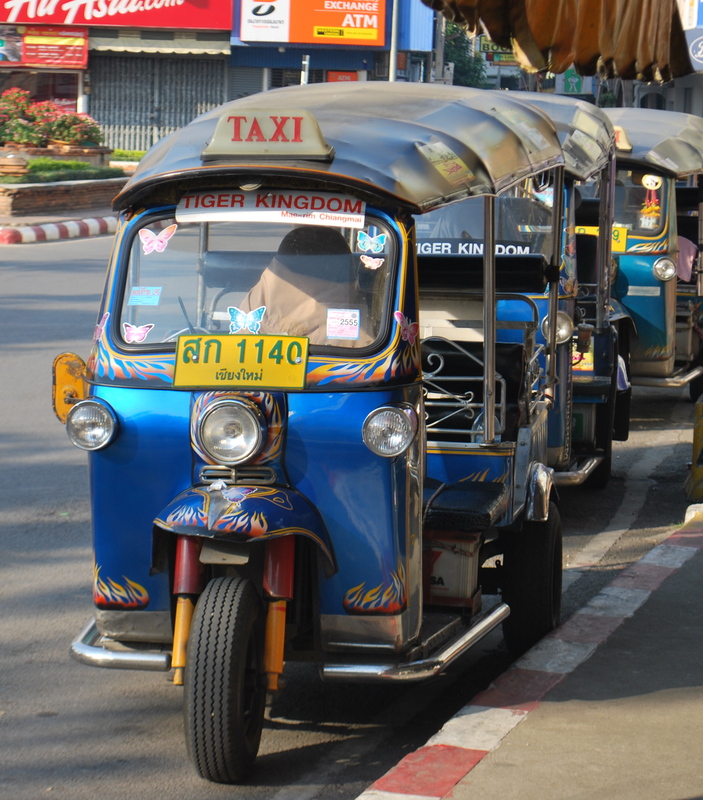 Love the tuk-tuks! Wow, sounds like a neat place! I can”t say I’ve ever researched Thailand or know much about it, but it’s great that they’re such happy people – too bad it’s not more like that here! The massages must be nice too. Enjoy your stay there!